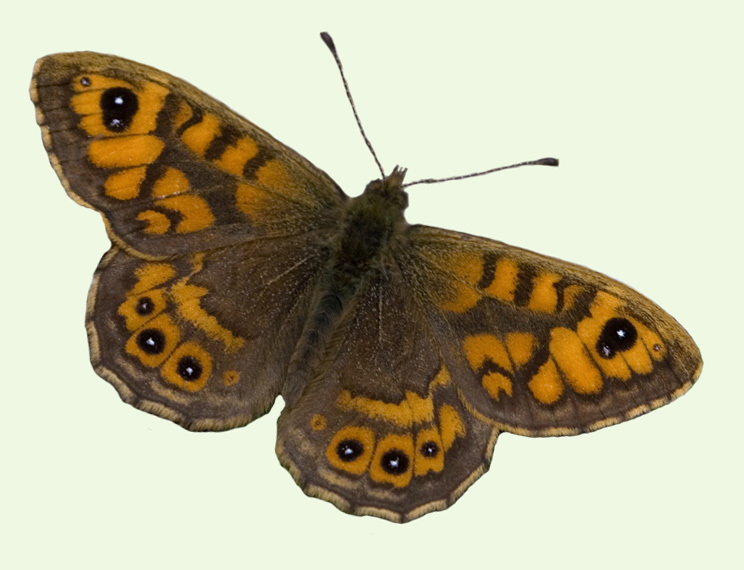 The uppersides, (which are easily seen as the butterfly often basks open winged in a sunny spot) are orange with darker brown borders. The apex of the forewing sports a white-pupilled black eye-spot. The hindwings also have similar but smaller eye-spots on the lower edge. The underside is a paler orange with an intricate zigzag pattern of greys and browns. The outer edge also shows six eye-spots. Double-brooded, sometimes triple-brooded. May to mid-June, late July to early October. Resident, locally scarce to frequent, widespread.